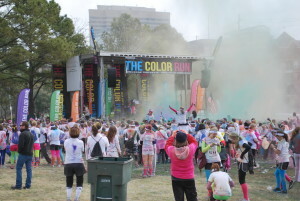 Color Run Tulsa 2016 | Performance Stage, Inc. 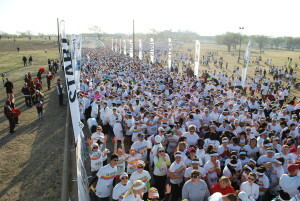 Billed as the Happiest 5K on the Planet, The Color Run is a unique twist on the traditional 5K race. Performance Stage has been proud to partner with The Color Run for their Tulsa race as well as a number of races throughout the country. For each race we provide our 32′ x 24′ Mobile Stage and a rockin sound system for the festival at the end of the race. The Color Run supplies a Zoomba instructor before the race and a DJ after the race, each of whom utilize the stage to get the crowd pumped up and participating in the famous color throws. At the start of each race, the runners line up into the start chute. 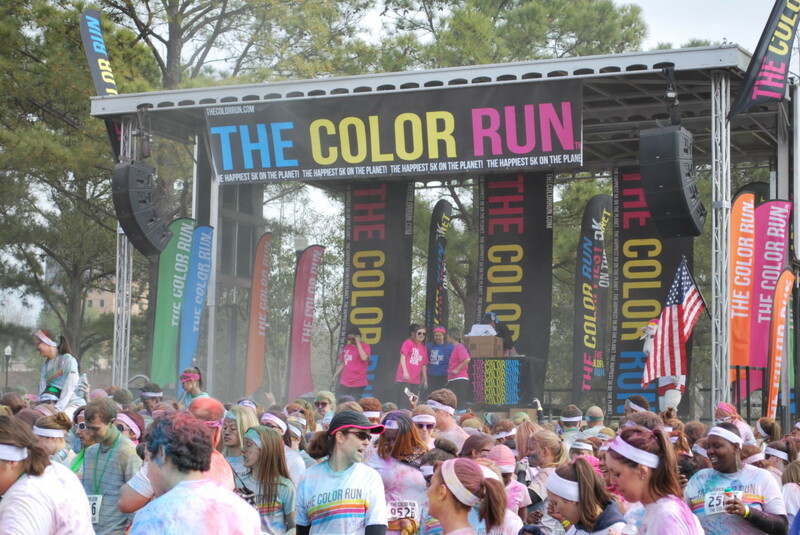 In keeping with the party atmosphere of the race, The Color Run supplies a DJ at the start line who keeps the crowd pumped up with the help of a 5-tower delayed audio system, making sure even the runners in the back of the chute get in on the action. Performance Stage, Inc. has been in business in the Tulsa area since 1997 and proudly provides full service or DIY audio, video, lighting and stage rentals, sales, setup, and/or consultation. We are the proud owners of two 32'x24' mobile hydraulic stages that are available for deployment anywhere in the United States. In addition to equipment rental, we also sell just about any theatrical supplies needed in the Arts & Entertainment industry. Installation services are also offered for any size job.